Camino jewellery charm earrings featuring a small gold-plated sterling-silver scallop shell charm (la Concha de Vieira) which is a representative symbol of the Way of St James (El Camino de Santiago) and the "Field of Stars" (Compostela) in northern Spain. These sterling silver CAMINO charm earrings measure approx 6cms total length from the top of the hook to the bottom of the charm. 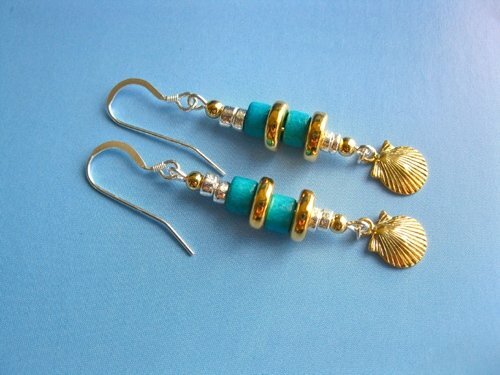 They consist of sterling silver ear wires with silver-coated and gold-coated ceramic washers, and colourful turquoise ceramic beads, finished off with the scallop shell charm. Gift these unique Camino de Santiago scallop earrings to inspire your friends or family and help them on their way in life. They come gift-wrapped, like all our presents - and we can print a personal message on your behalf.